Dame Florence Marjorie Wilcox,, known professionally as Anna Neagle, was an English stage and film actress, singer and dancer. Sir Alfred Joseph Hitchcock was an English film director and producer, widely regarded as one of the most influential filmmakers in the history of cinema. Known as "the Master of Suspense", he directed over 50 feature films in a career spanning six decades, becoming as well known as any of his actors thanks to his many interviews, his cameo roles in most of his films, and his hosting and producing of the television anthology Alfred Hitchcock Presents (1955–1965). Leigh-on-Sea, also referred to as Leigh, is a town and civil parish in Essex, England. A district of Southend-on-Sea, with its own town council, it is currently the only civil parish within the borough. Essex is a county in the south-east of England, north-east of London. One of the home counties, it borders Suffolk and Cambridgeshire to the north, Hertfordshire to the west, Kent across the estuary of the River Thames to the south, and London to the south-west. The county town is Chelmsford, the only city in the county. For government statistical purposes Essex is placed in the East of England region. Christ's Hospital is a coeducational independent day and boarding school in Horsham, West Sussex, England. Bitter Sweet is a British musical romance film directed by Herbert Wilcox and released by United Artists in 1933. It was the first film adaptation of Noël Coward's 1929 operetta Bitter Sweet. 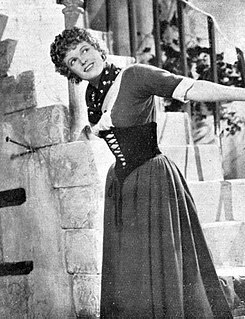 It starred Anna Neagle and Fernand Gravey, with Ivy St. Helier reviving her stage role as Manon. It was made at Elstree Studios and was part of a boom in operetta films during the 1930s. Heads We Go is a 1933 British comedy film directed by Monty Banks and starring Constance Cummings, Frank Lawton and Binnie Barnes. It was made at Elstree Studios by British International Pictures. Channel Crossing is a 1933 British crime film directed by Milton Rosmer and starring Matheson Lang, Constance Cummings, Anthony Bushell and Nigel Bruce. He made his stage debut in The Ringer in 1934 for the Watford Repertory Company and made his London stage debut in Chase the Ace the following year. He could be spotted in the films Late Extra (1935), When Knights Were Bold (1936), and Wedding Group (1936). He was in two musicals on stage, Spread It Abroad and Home and Beauty. Chase the Ace is a comedy thriller play by the British writer Anthony Kimmins. Originally staged in 1935 by the producer Harold French, it ran for 48 performances at Daly's Theatre in the West End. Amongst the original cast were Edward Chapman, Eric Portman, Michael Wilding, Patrick Barr, Warburton Gamble, Marie Lohr and Winifred Shotter. Wilding, a future film star, was making his West End debut. Late Extra is a 1935 British crime film directed by Albert Parker and starring James Mason, Virginia Cherrill, and Alastair Sim. When Knights Were Bold is a 1936 British musical comedy film directed by Jack Raymond and starring Jack Buchanan, Fay Wray and Garry Marsh. Songs include "Let's Put the People To Work" sung by Jack Buchanan, "Onward We Go" sung by Buchanan & soldiers' chorus, and "I'm Still Dreaming" sung by Buchanan. Virginia Lilian Emmeline Compton-Mackenzie, CBE, known professionally as Fay Compton, was an English actress. She appeared in several films, and made many broadcasts, but was best known for her stage performances. She was known for her versatility, and appeared in Shakespeare, drawing room comedy, pantomime, modern drama, and classics such as Ibsen and Chekhov. In addition to performing in Britain, Compton appeared several times in the US, and toured Australia and New Zealand in a variety of stage plays. Wilding was now one of the biggest stars in Britain—indeed he was voted as such by the readers of Kine Weekly. Director Alfred Hitchcock then cast him in two consecutive films that he produced through his own film production company Transatlantic Pictures (distributed through Warner Brothers Pictures). The first, Under Capricorn (released in 1949), in which he played opposite Ingrid Bergman and Joseph Cotten, was shot mostly in London but had final retakes and overdubs filmed in Hollywood. It was one of Hitchcock's few flops. His second film for Hitchcock was the more popular Stage Fright (released in 1950), also filmed in London, with Marlene Dietrich and Jane Wyman. Thirteen years later, in 1963, Wilding starred in an Alfred Hitchcock Hour episode titled "Last Seen Wearing Blue Jeans". Wilcox used him in a film without Neagle, Into the Blue (1950) and the public response was considerably less enthusiastic than for the films they made together. He put Anouk Aimée under personal contract and announced plans to make a movie together  but none resulted. MGM made an offer for Wilding to appear opposite Greer Garson in The Law and the Lady (1951);  the film was not a success. He returned to Britain for The Lady with a Lamp (1951), a biopic of Florence Nightingale with Neagle and Wilcox. It was popular in Britain, though less so than their earlier collaborations. Wilding journeyed with Taylor to Africa to appear in Zarak (1956) for Warwick Films, after which his marriage to Taylor ended. He began appearing regularly on U.S. television, including the title role in the 1957 episode "The Trial of Colonel Blood" of NBC's anthology series The Joseph Cotten Show . Wilding was married four times: to Kay Young (married 1937, divorced 1951),  actress Elizabeth Taylor (married 1952, divorced 1957), Susan Nell (married 1958, divorced 1962),  and actress Margaret Leighton (married 1964 until her death in 1976). Wilding died in Chichester, West Sussex, as a result of head injuries suffered from a fall down a flight of stairs during an epileptic seizure. His body was cremated and the ashes were scattered. James Neville Mason was an English actor. Mason achieved considerable success in British cinema before becoming one of Hollywood's biggest stars. He was the top box office attraction in the UK in 1944 and 1945, with notable films including The Seventh Veil (1945) and The Wicked Lady (1945). He starred in Odd Man Out (1947), the first recipient of the BAFTA Award for Best British Film. Richard Marius Joseph Greene was a noted English film and television actor. A matinée idol who appeared in more than 40 films, he was perhaps best known for the lead role in the long-running British TV series The Adventures of Robin Hood, which ran for 143 episodes from 1955 to 1959. Sir John Mills, was an English actor who appeared in more than 120 films in a career spanning seven decades. On screen, he often played people who are not at all exceptional, but become heroes because of their common sense, generosity and good judgment. He received an Academy Award for Best Supporting Actor for his work in Ryan's Daughter (1970). Robert Guy Newton was an English stage and film actor. Along with Errol Flynn, Newton was one of the most popular actors among the male juvenile audience of the 1940s and early 1950s, especially with British boys. Known for his hard living lifestyle, he was cited as a role model by the actor Oliver Reed and the Who's drummer Keith Moon. John Hodiak was an American actor who worked in radio, stage and film. Michael Joseph Anderson was an English film director, best known for directing the Second World War film The Dam Busters (1955), the epic Around the World in 80 Days (1956) and the dystopian sci-fi film Logan's Run (1976). 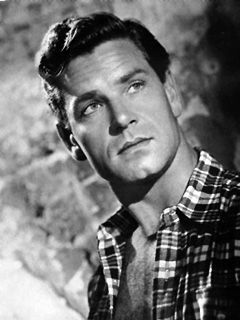 Anthony Maitland Steel was an English actor and singer best known for his appearances in British war films of the 1950s such as The Wooden Horse (1950), and his marriage to Anita Ekberg. He was described as "a glorious throwback to the Golden Age of Empire... the perfect imperial actor, born out of his time, blue-eyed, square-jawed, clean-cut." As another writer put it, "whenever a chunky dependable hero was required to portray grace under pressure in wartime or the concerns of a game warden in a remote corner of the empire, Steel was sure to be called upon." Herbert Sydney Wilcox CBE, was a British film producer and director who was one of the most successful British filmmakers from the 1920s to the 1950s. He is best known for the films he made with his third wife Anna Neagle. Ronald Alfred Shiner was a British stand-up comedian and comedy actor whose career encompassed film, West End theatre and music hall. Alan Marshal was an actor who performed on stage in the United States and in Hollywood films. He was sometimes billed as Alan Marshall or Alan Willey. Limelight is a 1936 British musical film directed by Herbert Wilcox and starring Arthur Tracy, Anna Neagle and Jane Winton. It was released in the U.S. as Backstage. Piccadilly Incident is a 1946 British drama film directed by Herbert Wilcox and starring Anna Neagle, Michael Wilding, Coral Browne, Edward Rigby and Leslie Dwyer. Wilcox teamed his wife Anna Neagle with Michael Wilding for the first time, establishing them as top box-office stars in five more films, ending with The Lady with a Lamp in 1951. Wilding was third choice for leading man after Rex Harrison and John Mills. Trent's Last Case is a 1952 British detective film directed by Herbert Wilcox and starring Michael Wilding, Margaret Lockwood, Orson Welles and John McCallum. It was based on the novel Trent's Last Case by E. C. Bentley, and had been filmed previously in the UK with Clive Brook in 1920, and in a 1929 US version. King's Rhapsody is a 1955 English musical film directed by Herbert Wilcox and starring Anna Neagle, Errol Flynn and Patrice Wymore. Wymore was Errol Flynn's wife at the time of filming. It was based on the successful stage musical King's Rhapsody by Ivor Novello. ↑ Flint, Peter (9 July 1979). "Michael Wilding, British Movie Star". Washington Post. Retrieved 10 April 2019. 1 2 "Michael Wilding Reached The Top The Hard Way". Weekly Times (4204). Victoria, Australia. 18 January 1950. p. 46. Retrieved 29 August 2017– via National Library of Australia. 1 2 3 4 "ENGLISH TO THE CORE". Voice . 23 (34). Tasmania. 26 August 1950. p. 4. Retrieved 29 August 2017– via National Library of Australia. ↑ "ANNA NEAGLE AND MICHAEL WILDING". Cootamundra Herald . New South Wales, Australia. 29 June 1948. p. 4. Retrieved 29 August 2017– via National Library of Australia. ↑ "BRITISH ACTOR Michael Wilding dies, aged 66". The Canberra Times . 53 (15, 995). 10 July 1979. p. 5. Retrieved 29 August 2017– via National Library of Australia. ↑ "GEORGE AND MARGARET'". The Telegraph (SECOND ed.). Queensland. 2 May 1938. p. 12. Retrieved 29 August 2017– via National Library of Australia. ↑ "FOR WOMEN". The Sydney Morning Herald (31, 363). 9 July 1938. p. 11. Retrieved 29 August 2017– via National Library of Australia. ↑ "DUAL HONOR FOR MICHAEL WILDING". Weekly Times (4194). Victoria, Australia. 9 November 1949. p. 49. Retrieved 29 August 2017– via National Library of Australia. ↑ "French Starlet Signed By Michael Wilding". The Newcastle Sun (10, 026). New South Wales, Australia. 18 February 1950. p. 6. Retrieved 29 August 2017– via National Library of Australia. ↑ "Studio Gossip". The Sydney Morning Herald (35, 252). 14 December 1950. p. 19. Retrieved 29 August 2017– via National Library of Australia. 1 2 "Vivien Leigh Actress of the Year". Townsville Daily Bulletin . Qld. 29 December 1951. p. 1. Retrieved 9 July 2012– via National Library of Australia. ↑ "Wilding signs U.S. contract". The Mail . 42 (2, 086). Adelaide. 31 May 1952. p. 7 (SUNDAY MAGAZINE). Retrieved 29 August 2017– via National Library of Australia. ↑ "No Lana -No Pay". Truth (3277). Sydney. 16 November 1952. p. 3. Retrieved 29 August 2017– via National Library of Australia. ↑ 'Bing's Lucky Number: Pa Crosby Dons 4th B.O. Crown', The Washington Post 3 January 1948: 12. ↑ "Bing Crosby Still Best Box-office Draw". The Sydney Morning Herald . 31 December 1948. p. 3. Retrieved 11 July 2012– via National Library of Australia. ↑ "Film World Anna Neagle: Biggest U.K. Box-Office Draw". The West Australian . Perth. 23 January 1950. p. 9. Retrieved 10 July 2012– via National Library of Australia. ↑ "Success Of British Films." Times [London, England] 29 December 1950: 4. The Times Digital Archive. Web. 11 July 2012. ↑ "Films That Make Money." Times [London, England] 28 December 1951: 7. The Times Digital Archive. Web. 11 July 2012. ↑ "MICHAEL WILDING DIVORCED". Queensland Times (20, 269). 20 December 1951. p. 3 (Daily). Retrieved 29 August 2017– via National Library of Australia. ↑ Wilding, Michael & Pamela Wilcox, Apple Sauce (London: Allen & Unwin, 1982) pp. 140-144. Wikimedia Commons has media related to Michael Wilding .